On June 22, German forces has taken possession by Parharch area showing on this direction the greatest efforts of infantry, artillery, tanks. 3d Soviet Cavalry Division basing on Strumilovsk fortification area, has organized a defense on the Blotny river. The units of 41st and 159th Rifle Division have occupied Rava-Russkaya fortification area, and 97th Rifle Division defended on a boundary Mloduv, Hotynets. The private battle order Commander of Southwestern Front put a task:"since morning 23.6.41 in interaction with 4th Mechanized Corps and 3rd Cavalry Division of 6th Army put impact in a direction Radzehuv, Sokal and destroy German Panzer Group acting in this direction". From the south, from area Brody, on Radzehuv and Berestechko came 15th Mechanized Corps of the general I.I.Karpezo and 8th Mechanized Corps of the general D.I.Riabyshev. June 23, the German armies continued offensive on Lutsk, expanding break between 5th and 6th Soviet armies. Per the same day the realization of Soviet counter-attack began. In the morning in area Radzehuv, at the front width 70 kms, 15th Motorized Corps has passed in counter-attack, but having carried the large losses, was compelled to depart. 4th Mechanized Corps of the general A.A.Vlasov, instead of participation in impact on the German 1st Panzer Group, was directed to liquidation of break between 6th and 26th Army in Mostiska area. The German offensive during 23.6.41 at the front of 3rd Cavalry, 41st and 159th Rifle Divisions was stopped. THE REPORT OF THE COMMANDER OF 6th ARMY TO THE CHIEF OF A STAFF OF SOUTHWESTERN FRONT FROM JUNE 25, 1941 ABOUT CONDITIONS IN A STRIP OF ARMY TO OUTCOME OF June 24, 1941. 1. The opponent 24-25.6.41 did not show the special activity, continuing, however, methodical raid of aircraft and attack on Rava-Russkaya direction. In total at the front armies acted seven German field divisions, from them: to the southwest of Krystopol one field division; on Rava-Russkaya - three; on Nemirov -one regiment; on Yavorov-two field division. 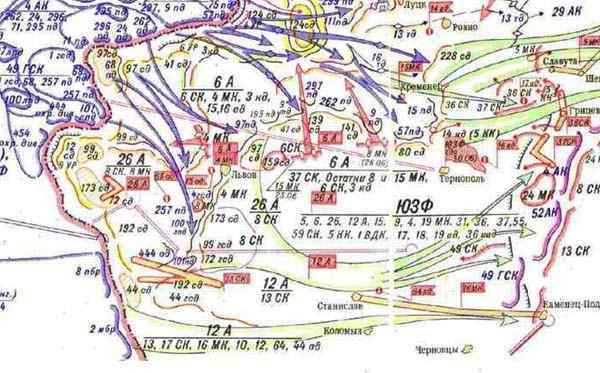 There is a heavy artillery, firing to Zhulkev area(33 kms). Tank formations on 24.6.41 in area to the south Krystopol (noise of motors) are found out again by evening. Probably, the new attack through Radzehov or through Mosty Velke prepares. Germans use all means for disorganization of our rear. In the afternoon 24.6.41 in Lvov have begun separate shots from windows, from lofts. Except the members of nationalist antiSoviet organization, probably, the groups of the parachuters going in the city have accepted. The parachuters, ostensibly, put on in our military form. The shooting in the streets proceeded in Lvov till late night. The measures to arest of such local inhabitants are accepted. The Lvov garrison is strengthened by 202th Motorized Regiment. Around Lvov anti-tank defenses are done. The often phenomena became breaks of communication, noise on radio transivers. The right flank of 6th Army is open also attempts to contact to 5th Army have not given results, this is weakest place in an arrangement of 6th Army. 2. The formations of army continue to cover frontier area. From 15th basic fortification areas with long-term firing places, Germans destroy only 2nd basic items and 4 basic items blocked by them, can also be destroyed. The work of German aircraft is based on long attacks by fine groups within all day, that very much exhausts forces. The heaviest situation in Rava-Russkay and Yavarun, where the opponent continues the attacks. Germans aspire wedge in an interval and create threat of an encirclement of (41th and 97th Rifle Division). By evening 24.6.41 the break between 159th and 97th Rifle Divisions has achieved 40 kms. In this interval, Germans moved and have occupied Nemiruv city. Lvov bombarded several times per day, and the communication between Soviet fornations frequently interrupts. a) from Krusnopole; b) on Rava-Russkaya; c) on Yavoruv>; d) Kamenka-Strumilovo. a) 3rd Cavalry, 41st and 159th Rifle Divisions to continue a defense of occupied areas. b) 4th Mechanized Corps, 97th Rifle Division took impact on German formation, coming along a highway on Yavoruv. Further it is supposed 4th Mechanized Corps turn on north and break German units coming on Rava-Russka. c) Reserves: 8th Tank Division, 202nd and 8th Motorized Regiments. Soviet command of 6th Army planned to use 4th Mechanized Corps since morning of June 25 in a strip of 97th Rifle Division, where there was heaviest conditions; after attack under Nemirov to concentrate it in 5 kilometers to the east of city, and then, since morning of June 26 to use in a direction Smolin, Podemchina. To outcome of June 24, tank regiment of 32nd Tank Division> have occupied a defense on the western edge of Ynovsk wood, near Nemirov. Soviet forces were not possible to close a gap, formed between 6th and 26th Army, and rout Germans. By evening of the same day, Germans began to be distributed to the east, bypassing 32th Soviet Tank Division from the south. Soviet Command give the order on a withdrawal, at first in Rava-Russkaya, and then on Lvov. June 26, forces of 1st Panzer Group and 6th Field Army rendered Soviet counter-attack of 9th and 19th Moechanized Corps from the north and 8th and 15th Mechanized Corps from the south, having entered in counter tank battle by 9th, 11th, 14th and 16th Panzer Divisions of Germans. Soviet 9th and 19th Mechanized Corps during June 26-27 combat with German divisions of 3rd Panzer Corps, but under impacts of aircraft were compelled to depart in area to the west of Rovno. Soviet 8th M.C. put impact to German 16th Panzer Division, having advanced on 12 kms. In night on 27.06 it was removed from combat and began a concentration behind the 37th Rifle Corps. Commander of Soviet 6th Army the general - lieutenant Muzychenko has required from commander of 4th Mechanized Corps mine all roads to Lvov and blow up all bridges. Nevertheless, on June 29 the Germans has left on the nearest approaches to city. Early in the morning of June 30, German 1th Mountain Division has brought down from one defenses of Soviet 32nd Tank Division and by 5 hours has rushed on the southwest outskirts of Lvov. The Soviet forces have begun to leave city. On the eastern outskirts of Lvov departing formations of 4th Mechanized Corps were replace by restored 159th Rifle Division, strengthened by Motor-rifle Regiment, which have fastened urban fights. But was already too late - Lvov was lost.